A front hardshell binding with classic black. 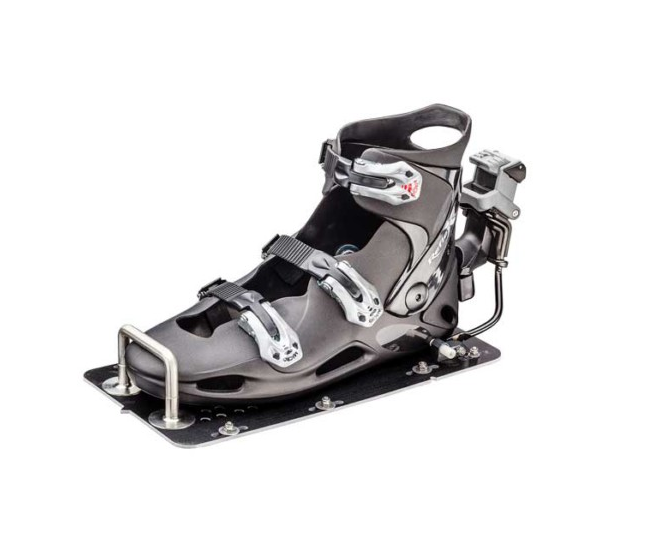 Comes with G10 short plate or carbon plate, front toe bar and release. See product description below for the difference between white and black cuff bindings. What is the difference between White and Black Shells? The base of both shells are the same with high stiffness. The white upper cuff has more torsion flexibility to release the leg above the ankle providing greater accuracy and comfort. Also, the white cuff allows the skier to move more on the rear before the wake. A flexion brake made out of webbing strap limits the forward flexion and allows the skier to have more power on the tip of the ski. The black cuff material is stiffer but its geometry allows to the skier to flex forward as he needs but there is a limitation of the backward flexion. The black cuff is mainly used by trick skiers but it has also been used successfully in slalom. There is no flexion brake strap that’s why it is less expensive than the White Hardshell.